Josh's parents help him get ready for school. Josh is portrayed by Jack Janssen, while his parents are portrayed by Chrissy Calkins Steele and Geoff Callaway. Photographed by Kim Howland. Bankside Repertory Theatre Company debuted their third play of season three, "Falling," written by Deanna Jent, a St. Louis playwright. 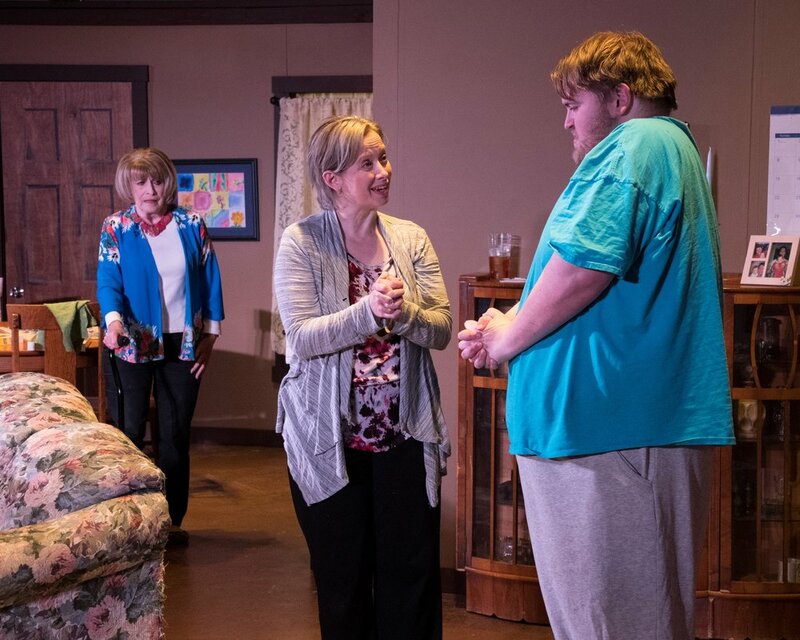 The play explores the day-to-day life of a family with an autistic 18-year-old son at its center. In addition, it questions what family really means and the joys, sorrows and setbacks that comes with a family. Walking into the Jacoby Arts Center in Alton, the set was a large section of the gallery space with risers and chairs stacked very closely to the stage. The set never changed during the 90-minute play, decorated exactly like what a normal living room and dining room looks like in many homes — a sofa, family pictures, a TV, puzzles and wall decor — which allowed an intimate look into the characters’ home. Directed by Sue Ellen Coughtry, “Falling” focuses on the mother, Tami, of the family. She takes care of her husband and two children nonstop, never focusing on herself. The stress takes over her quickly and was portrayed amazingly by Chrissy Calkins Steele. The audience could feel the stress and heartache she felt at every given moment as if they were with her along the ride. Tami, Josh's mother, helps Josh calm down in front of Grammy Sue, portrayed by Tommy Nolan. Photographed by Kim Howland. 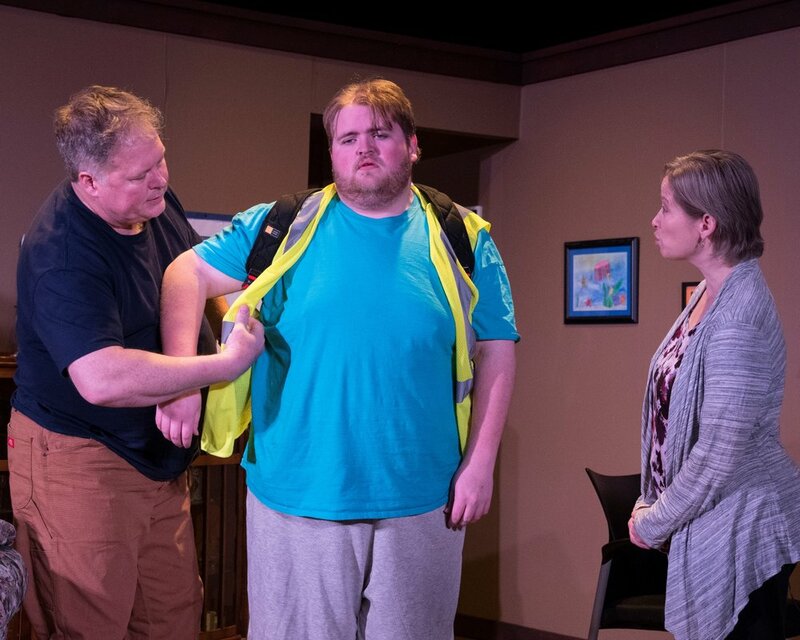 The play explores the ups and downs of living with a moody teenage daughter, Lisa, portrayed by Hannah LePoidevin, and son, Josh, portrayed by Jack Janssen, with low-functioning autism. “Falling” displays the fear characters feel due to the unexpected violence Josh might experience while upset, and, on the other hand, shows the deep knowledge of communicating with him and helping him calm down. In addition, it shows the unconditional love a mother has for her children and family. At the end of the show, actors and the director came out and hosted a question and answer session. It was said Jent, who has an autistic son, was asked daily how her day was, and she decided to write this play to answer it. Also, Janssen, who played Josh, said he was diagnosed with mild autism as a child. Jenssen explained that he was a nonverbal kid, but theater helped him and became a form of therapy — art is therapy. During the play, April 19-28 and throughout the month of April, Jacoby Arts Center featured an exhibition of artwork from the autism community. These pieces shed light on the importance art has for everyone and celebrated the talent of those featured. Bankside Repertory Theatre Company’s next show is “The Complete Works of Shakespeare” by Adam Long, Daniel Singer and Jess Winfield June 21 through 30.